Whether it’s for a holiday, birthday or another special event, gourmet food gift baskets are an idea if you’re looking for something that’s easy to make and that offers a variety of items for the person receiving the gift. A basket that features the flavors of New England is an idea if the person enjoys rich flavors and likes to prepare everything from pancakes to biscuits. This is a basket that would feature more in the way of honey, jams, molasses and other items of the same kind as these are the things that you’ll likely find if you visit the area. Add a few books with pictures of New England and a few sauces. A beautiful picnic basket would be an idea for containing the items. Most people enjoy chocolate of some kind. A basket with Godiva chocolate or another specialty brand would be ideal for a holiday or a birthday. Use a simple basket or container with a ribbon around the side to start with. Then, add larger pieces of chocolate and a few smaller pieces that can be enjoyed on a daily basis. You want to offer a few different flavors of chocolate along with pieces that have fillings, such as coconut or strawberry, to give a large selection depending on what the person enjoys. 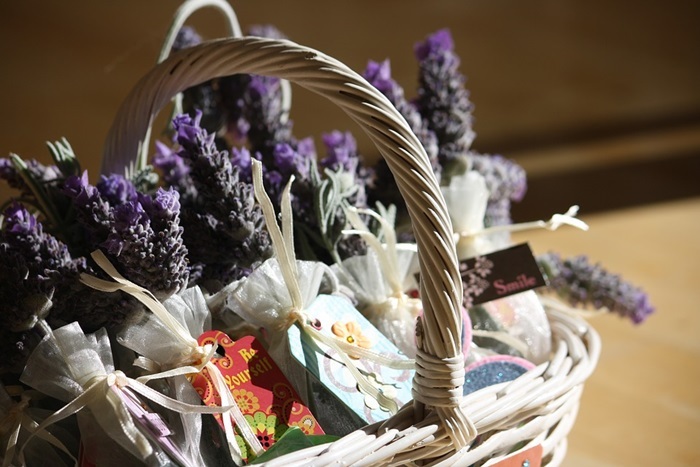 For the person who likes to relax after a long day, make a basket with teas, a wine bottle or two and a few items that can be enjoyed while taking a bath. You might want to add bubble bath, bath salts or even a few flower petals that are made from soap. Don’t forget the wine glasses or the mugs to enjoy the beverage. When adding the tea or coffee, think about the flavors that the person likes as you can get a variety from specialty stores and even retail stores that have a larger selection of beverages. You might want to add a few muffin mixes or a lemon or two so that the person can make a nice snack or add a little twist to the drink that is made.